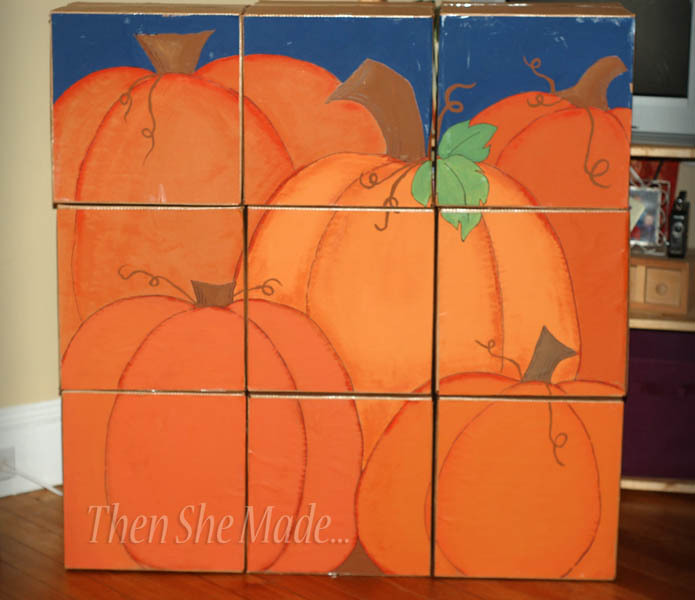 A Pumpkin Themed Box Puzzle.... Strange, right?! - now let me explain. For two years I was the Activities chairman AND committee for my church - yes, just me. My job - I didn't get paid - was to plan, prepare, and present fun activities for the members that attended my church. I'd try to have an activity every quarter if not every couple of months. The challenge for this particular activity was that it had to be family based, focused on fun for the kids, and needed to be done on a small budget. The giant box puzzle was just one of the budget friendly games I came up with. 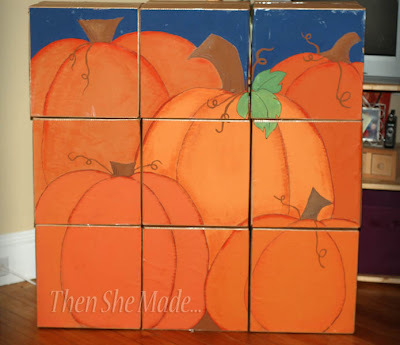 It's basically just a mural that I painted on 9- 14x14 boxes (bought at Walmart). At the event the boxes were all mixed up and the kids had to put them back in order like a puzzle. It's a simple idea but I tell you what, it was a hit with the kids between 3 and 8! Some of them did it several times. Seriously, that's it. If you don't trust your painting/drawing skills go buy a $1 fall themed coloring book and use it as your guide for your design. And as an added bonus, the cool thing about this craft is that the boxes can be collapsed, stored and used again. Or if you're like me, you'll recycle them and use them for moving boxes. Enjoy! And, have a great Labor Day Weekend! Oh! That is cute! And fun! Thanks for linking it up today! Have a great Labor Day weekend!